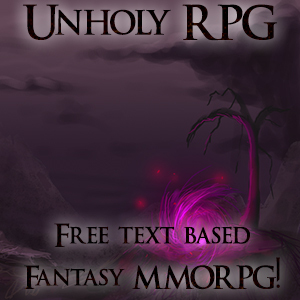 Unholy RPG is a game where you play a human warrior set in an evil and unholy fantasy world. Train your stats, search for valuable weapons and items, maybe create your own items at the workshop, compete for #1 in the hall of fame in a variety of options, learn the market to earn money. Even create your own guild. That way you and your friends can wreak havoc upon this evil world. Become a part of the growing community, So why not register today for free. LOVE this game. NO attention seekers and everyone is very nice, admin is great. New game so things are still being put into place but if you are looking for a great place to hang out, come join us. Pretty good game. Very unique in a lot of aspects. If your tired of being forced into a mob or mafia this is a good game.